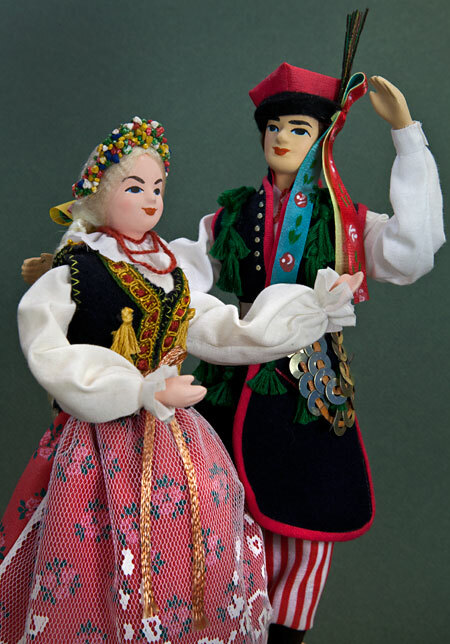 Polish male and female ethnic dolls made with ceramic head and extremities and stuffed cloth torso. 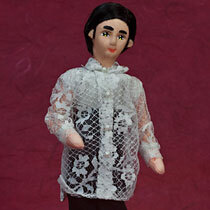 The woman is wearing a colorful costume, featuring a black vest with appliques and tassels, white blouse, white lace apron, and red print skirt. 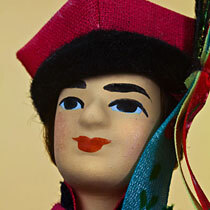 She is wearing a flower head piece (vinok)—a headband with flowers that has long flowing ribbons down the back. 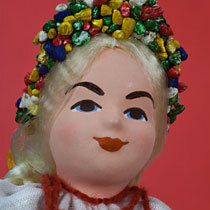 She has a red yarn necklace that symbolizes the red coral necklace that is traditional in Polish culture. 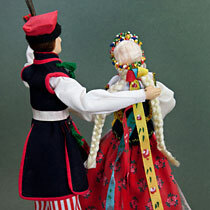 She is dancing with a man who is wearing a black waistcoat with red trim and green tassels, striped trousers, a red krakuska (four-cornered) cap decorated with ribbons and feathers, and he has metal rings attached to the belt. 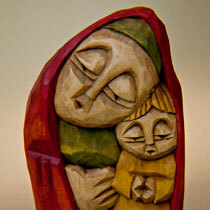 Tag says “HAND MADE, St. Wyspianskiego, Krakow. 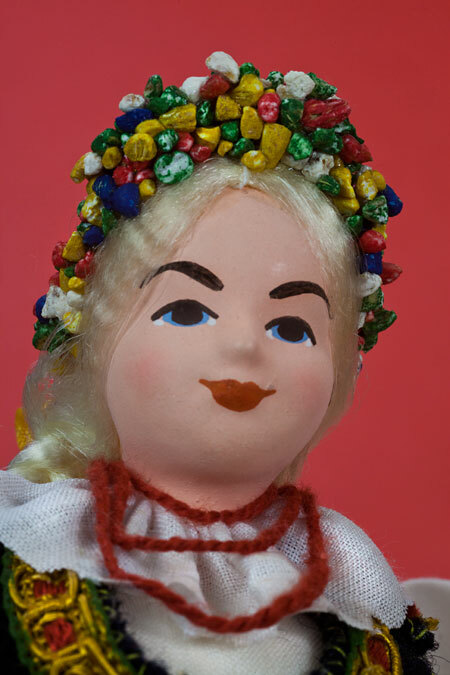 My name is Joanna, and I live near the Polish town of Krakow with my brother (Karol), my parents, and my grandparents. Krakow is over 1000 years old and has many old and beautiful buildings. We even have a castle in our town. 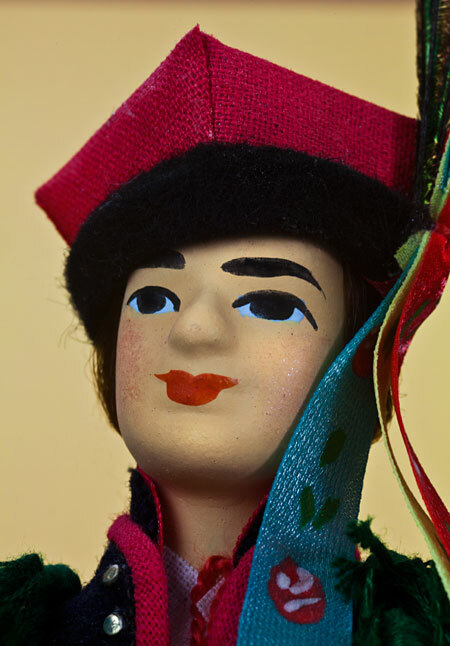 My brother and I are members of the folk dance club in our school. 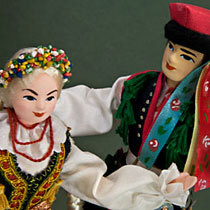 You can see us in the picture wearing traditional Polish costumes. 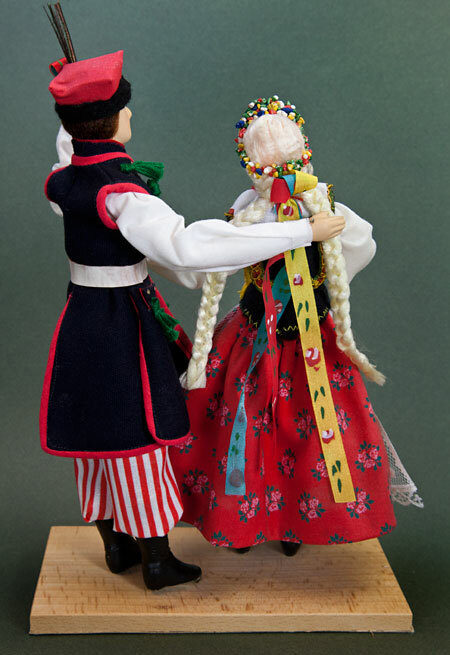 We do dances that are popular in the Polish culture, such as the polonaise, mazur, and krakowiak. 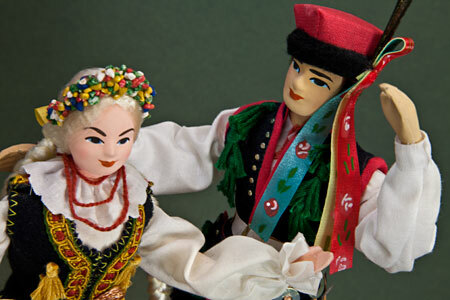 We also dance the polka. When I’m not in school, I like to help my grandparents in the garden. My grandma grows beautiful roses, and sometimes we sell them at the open market. My grandparents know a lot about history. They can still remember World War II, and they often tell me stories from their childhood. In 1939, Poland was invaded from the west by Nazi Germany and from the east by Communist Russia. During those days, both countries were ruled by ruthless dictators (Hitler and Stalin) who did not respect human lives. Millions of people died in the battles and in concentration camps that were built by followers of Hitler and Stalin. One of those Nazi death camps, named Auschwitz, was located only 100 kilometers from my home town. There is a Holocaust museum there now. I went there with my school class to learn more about the genocide (killing) of Jewish, Polish, and many other people. It was a very sad experience for me. Nazi Germany was defeated by Allied forces in 1945, but then the Soviet Union took control over a large portion of the Eastern Europe (including Poland). My grandpa told me that many of his friends were sent to labor camps in Siberia (Russia) and never came back. Stalin died in 1953, but it wasn’t until the 1980s when Poland became an independent country again. 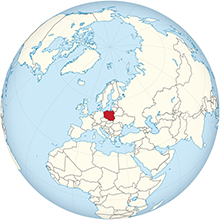 In 2004 Poland joined the family of 25 other nations in what is known as the European Union (or EU). My generation does not remember any wars, and we all live in peace now. I have some German and some Russian friends. We speak Polish at home, but I’m learning English and German in school. I hope to go to a University in Germany one day. When I grow up, I would like to work for the government of the European Union so that we never see another war.